People in Germany came up with an idea in which they covered walls with super hydrophobic paint. So all the pee is splashed back over the person peeing. Originally developed by Nissan to keep cars clean from dirt, the water-repellent paint acts as a reflector. 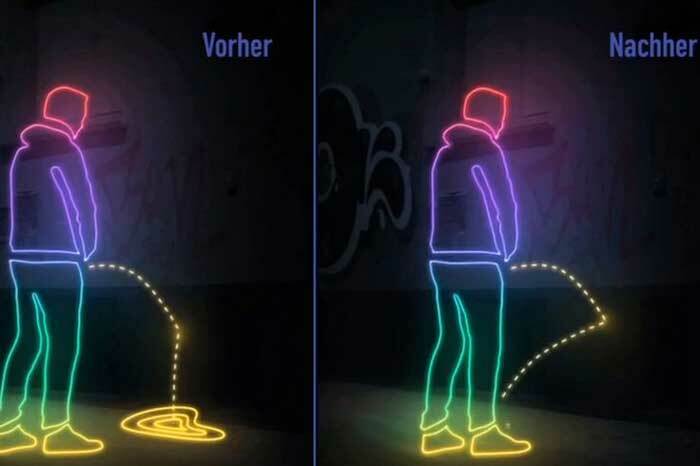 It costs about $700 to cover six square meters with urine-repelling paint. According to Ultra-Ever Dry, a paint manufacturer, an object coated with hydrophobic paint develops a surface chemistry and texture with patterns of geometric shapes that have “peaks” or “high points”. These repel water, some oils, wet concrete and other liquids.